The first film in the Hobbit trilogy was good - not great, not outstanding, but it was solid. Unfortunately for some of us, the action figures were few and far between. While I saw plenty of the 4" series (and still do), the better 6" figures never made it to my neck of the woods. But NECA has picked up ball for the license with their quarter scale series. They've been hitting this scale pretty hard lately, and I'm all for it. I just reviewed their Iron Man last week, and I can guarantee you I'll be looking at their Tonto very soon. 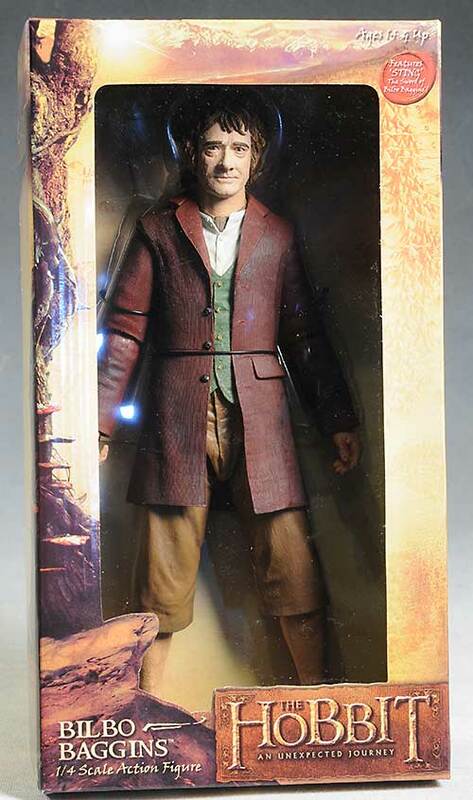 The first in their new Hobbit series was Gollum, and now they are following that up with the Bagginsssss himself. This guy runs around $50, depending on the retailer. Finding him might be a bit tricky, as it seems that not a lot of retailers have this guy in stock. That's a pity, since there hasn't had a ton of support for the film collectibles in general. He comes in a box, not too big, not too small, but just right. You can see the figure easily through the window, and the colors, graphics and text are all well done. It's not collector friendly though, and you should break out the wire snips. There's 6 or 7 heavy duty twisties to cut your way through, but it's better than trying to untwist them all. 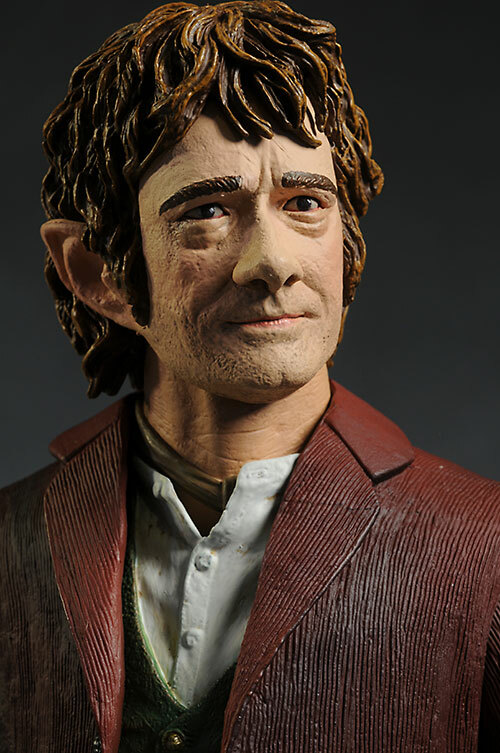 I'm not digging this portrait - it doesn't jump out at you as Bilbo, at least not in the first film. 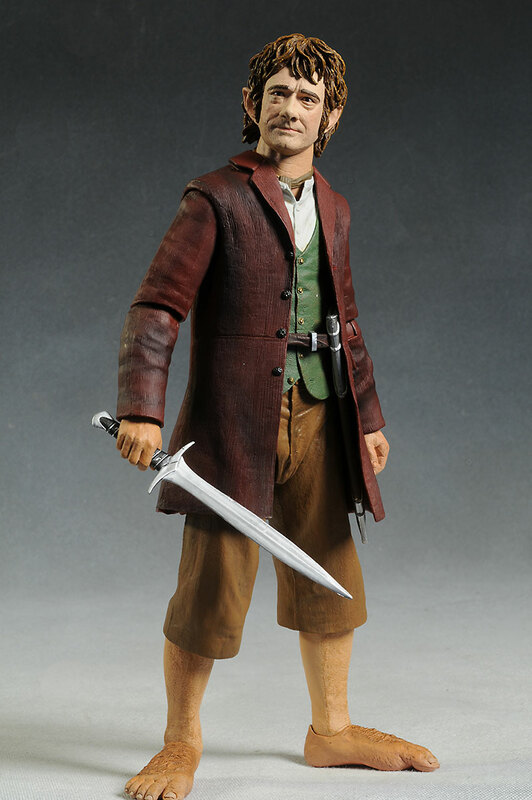 He looks older here, more of a combination of the young Bilbo and the older Bilbo from the Lord of the Rings series. Part of the problem is the heavy skin texture. I'm all for adding realism to figures like this with wrinkles, texture and pocks, but they went over the top and half way down the other side here, and it hurts the on screen accuracy. The hair looks great though, with just the right amount of detail. He's also just about perfect from the neck down, with layers of soft, rubbery clothing that moves and flows with the articulation. Here there's also lots of texture and detail, but it's appropriate to the look of the character. 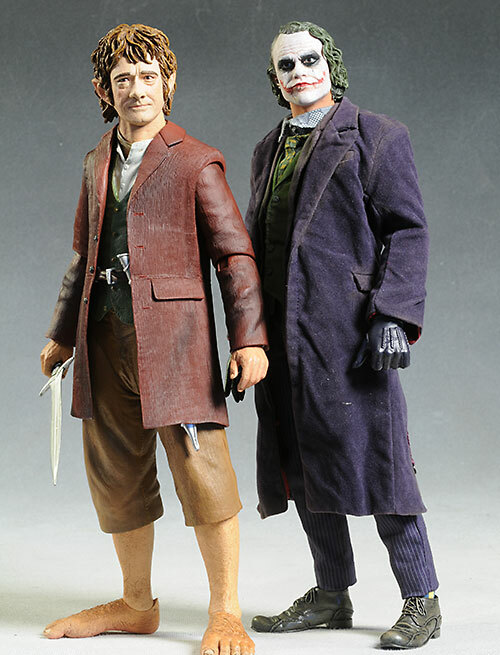 The hands are sculpted appropriately - the right is perfect for holding Sting, while the left is in a useful gesture pose. 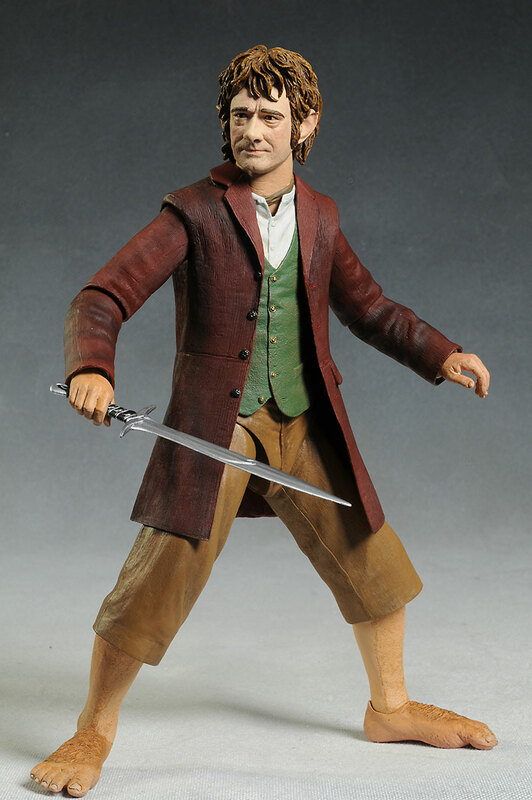 This guy is quarter scale, but since he's a Hobbit, that means he stands about 12" tall. The paint work is solid, but not quite at the level we saw with the recent Gollum/Smeagol. The hair is well done, and the consistency and coverage of the broad colors of the costume are all very good. There's some details that are lacking, like the shirt buttons, but considering the price point, it's about right. Perhaps the best paint feature is the nasty, hairy feet. 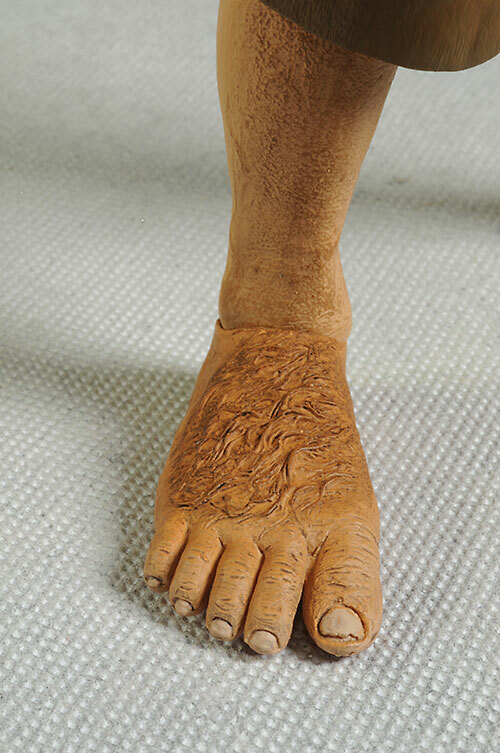 The sculpt looks great, but it's the paint that brings out the detail in the furry covering and cracked toe nails. 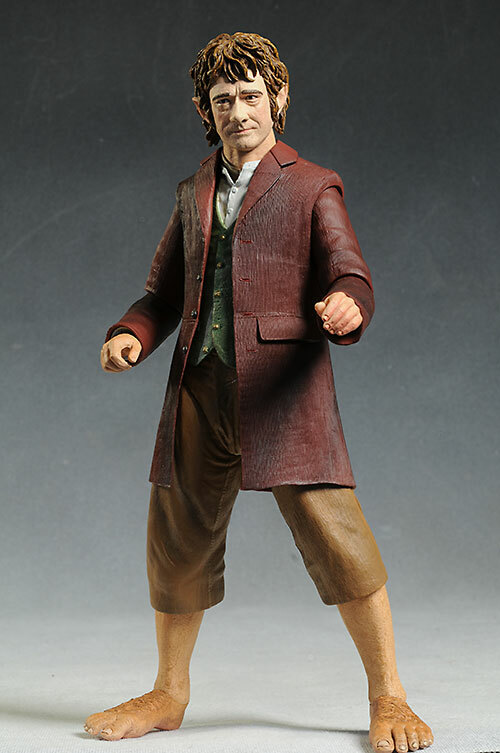 The best feature on this particular figure is the amount and style of articulation. Like Gollum before him, there's enough joints to get great poses, even deeper action stances, and you can get that natural flow that's so critical. It starts with a ball jointed neck at not one but two points - below the chin line, and at the torso. The head can turn, tilt and lean with the best of them. There's what have become known as NECA shoulders, which have a reasonable range of movement without ruining the sculpt. Pin elbows and cut wrists finish off the arms. There's a cut waist, ball hips, pin and disc knees (which allow forward and backward movement, but also turn on the axis of the leg), and ball ankles. The ankles are great, allowing the feet to remain flat on the floor in most stances. While this isn't as articulated as a standard sixth scale figure, he's much more articulated than most of the old school all plastic quarter scale figures. Compare this to the 4 or 5 points that Aragorn, Gandalf or Legolos had, and you'll be amazed. Sadly, there's not quite as many accessories as I'd like, especially considering the character. His staff and backpack would have been great, considering he's wearing his walking duds. But they did give us Sting, along with the sheath and belt to carry it. The blade is very thin, but hard plastic, so it shouldn't wilt or lose shape over time. The rubbery belt has to be worn pretty high on his hips over the vest, but it can be done. The sheath looks great, and the sword fits inside easily. You can also put the belt over one shoulder, if you'd prefer that look. While I have my issues with the likeness, most kids will overlook that in favor of the cool articulation and decent size. With Gollum already out, you have a nice pair to face off in the depths of your backyard Mordor. It's hard to find any sort of 12" figure for just $50, but one with this quality is even rarer at that price tag. While I would have liked a few more accessories, I have to admit that this guy is a better than average value. 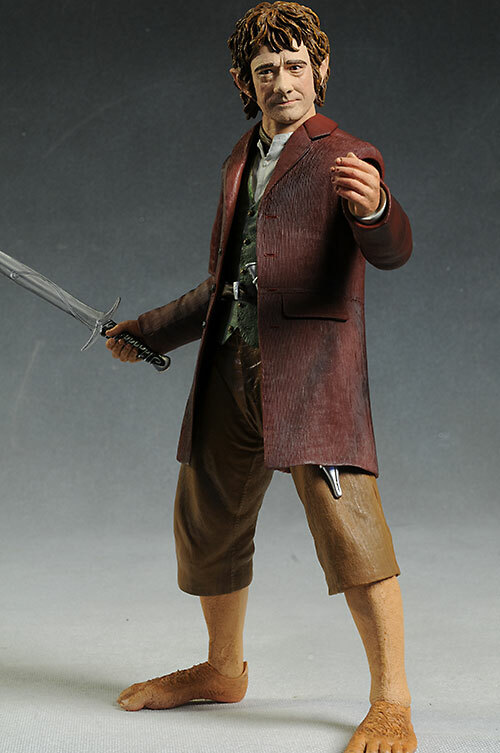 I have to say that while I have my issues with the likeness here, NECA has my heart right now. They are taking on licenses that others are afraid of, producing figures in scales like this that are high risk, and yet they are finding a way to do it, and do it well. 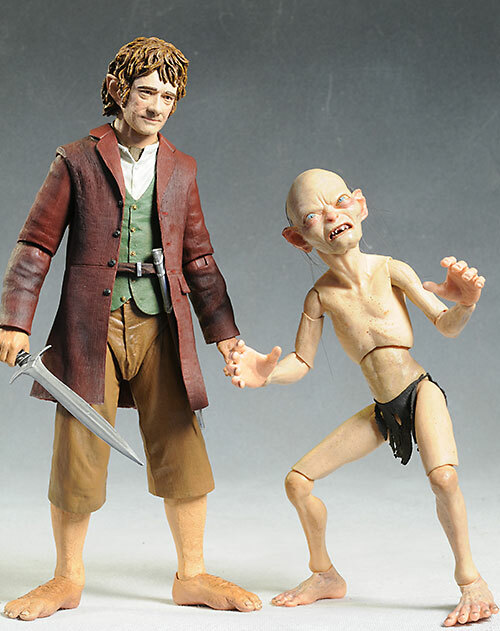 I can't wait to see more of the Hobbit and Lord of the Ring figures in this scale, and I hope that NECA really blows us away at next month's San Diego Comic Con. Remember to check back here for daily updates at the show, or better yet, follow me on Twitter. - has him for $48. 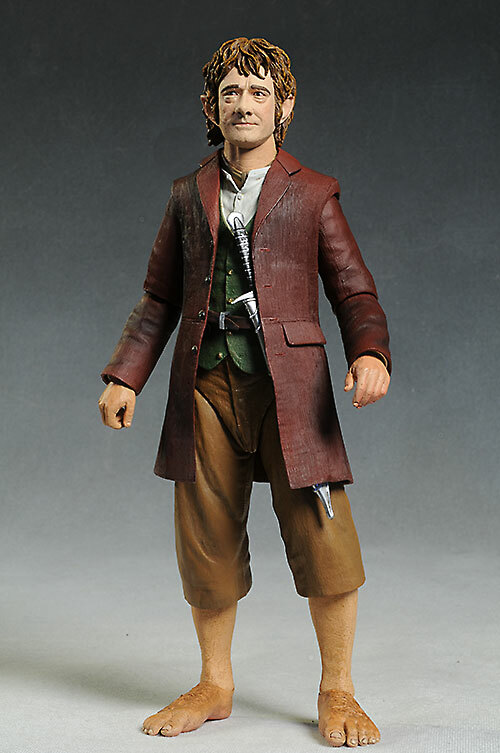 Other quarter scale Lord of the Ring/Hobbit figures incllude Gollum, Aragorn, Gandalf.